Toast. What do you put on your toast? Strawberry jam and butter? Cinnamon sugar [and butter]? 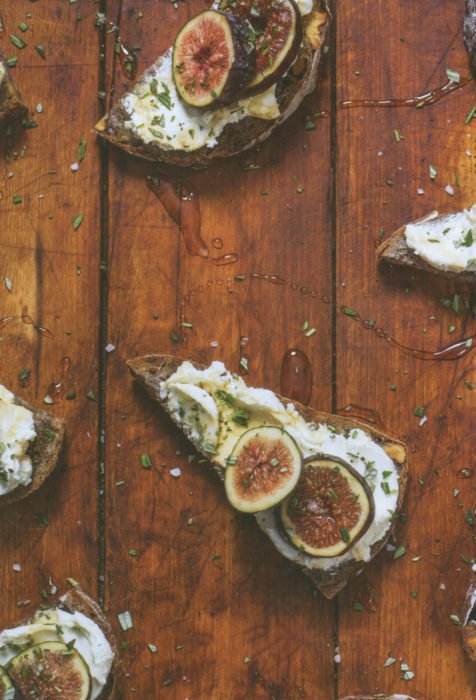 Probably not this combo of figs, goat cheese and rosemary, dribbled with a dash of honey. The recipe comes from bring it! by Ali Rosen and is offered as app for your next family gathering or barbeque. It’s a surprising and refreshing combination to be sure. Ali notes that this dish is intended for the fresh frigs of late summer. But you can use dried figs instead. If you do, because they are stronger in flavor and sweeter, use about half the suggested amount of figs and eliminate the honey. Or, keep the honey and enjoy something very sweet and delectable. Slice the figs into discs about 1/2 inch thick. Cut each slice of bread into 4 triangles. Spread the goat cheese on the bread. Lay the fig slices on top of the goat cheese and then sprinkle the rosemary on top. Drizzle the honey evenly across the toast (it should be a very small amount since the figs are already sweet) and then finish with the salt.